Generally, your bathroom is one of the smallest rooms in your home. However, households spend a great deal of time in their bathroom and often have many personal items vying for limited storage space. Read on for some helpful bathroom design tips to make the most out of this limited space, while also giving your bathroom a refreshing facelift. A relatively cost-effective and simple way to make your bathroom feel bigger is by painting the walls a soft color. A pale hue will instantly give the illusion that you have more space than you really do. While it may be tempting, try to avoid picking dark, bold colors for your walls. Instead, consider tying these in when selecting accessories like towels and decorations. Cluttered floors make your bathroom look cramped. Consider opening up your floor space by investing in an over-the-toilet storage solution, a wall-hung vanity, or a recessed medicine cabinet as a functional way to add storage and save space. Dumping the shower curtain for clear glass shower doors will instantly open up a large portion of your bathroom. This minor bathroom remodeling project can make your shower area feel like part of the entire room and give the appearance of more space. You can also expand a small bathroom by making the ceilings feel higher than they really are. This can be achieved by installing a ceiling medallion and/or crown molding, which can draw they eye up. Choose these upgrades carefully, however, as oversized accents can end up making your space feel even smaller in comparison. Natural lighting goes a long way toward brightening up any room, and thus, making it feel larger and more inviting. 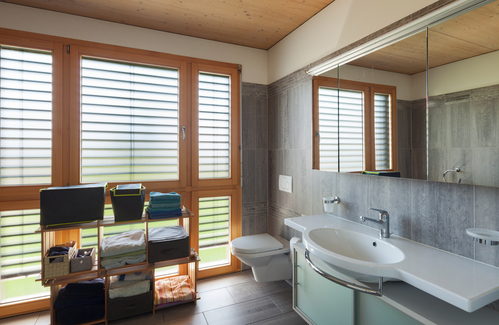 If possible, consider installing a larger window in your bathroom. If not, choose light curtains and keep them drawn open to allow as much light in as possible. Looking for assistance with your bathroom design or remodeling? Turn to Devine Creations Design Center, the go-to design firm for home makeover projects in Monmouth County, New Jersey. With more than 15 years of kitchen, bathroom, and home remodeling experience, they provide beautiful designs and expert installation work, as well as top-notch customer service and high-quality products. You can speak to one of their friendly store associates today by calling (732) 856-9661. You can also visit their website any time to learn more about their bathroom design expertise and full home remodeling experience.